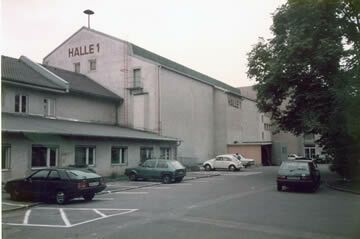 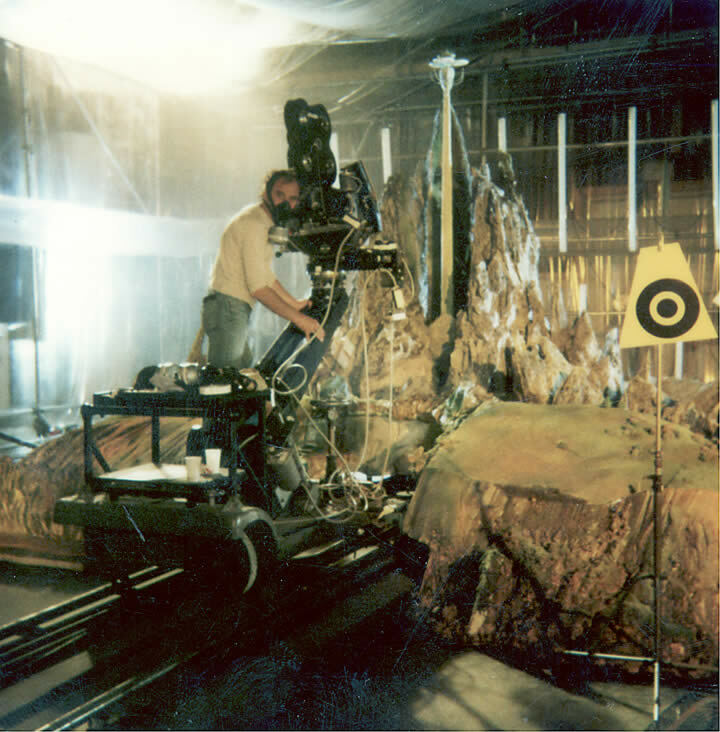 We moved into Halle 1 at the Bavaria Film Studios, Munich and gradually over a period of 2 weeks we were able to start testing the equipment and motion control gear. 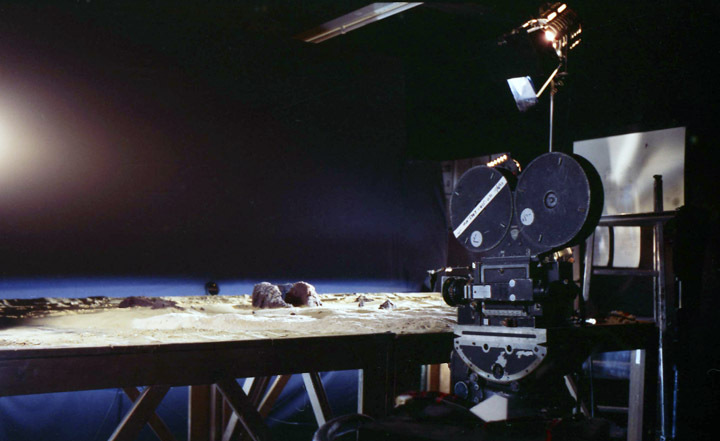 Tony Fox organised the construction of a cement base for the camera tracks as the wooden floor of the studio wasn't sufficient to keep vibrations to a minimum. 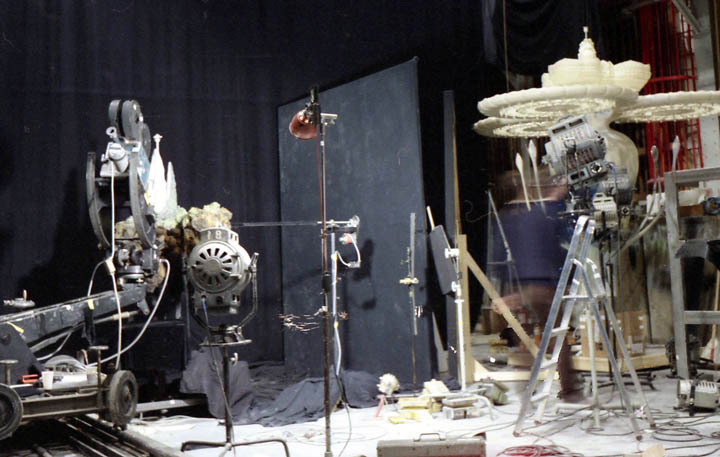 We discovered that the studios was an Aladdin's Cave full of VistaVision equipment left over from the 50's and consisted of 2x Mitchell (Elephant Ears) Vistavisions, 1x Paramount Butterfly Vistavision, a partially built Vistavision rostrum with various Technorama, Nikon and Leitz lenses included but the icing on the cake was a Mitchell S35R and Bell & Howell 35mm clapper gate camera. 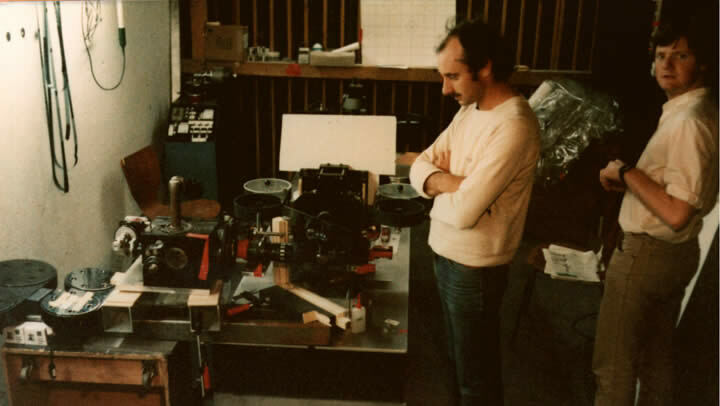 We were drooling over this amount of equipment and via Bob Edwards (Executive in Charge of Production) we were able to do a deal in buying the whole lot after the production had finished. 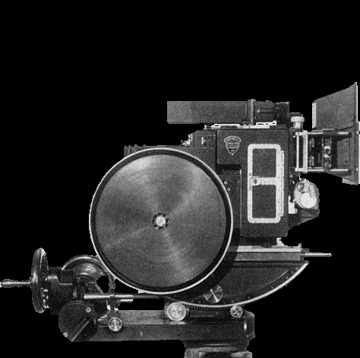 We already purchased a Vistavision Technorama camera prior to starting the film and were already building a nodal pan and tilt head (we called a Field Recorder) which we later used for all the real-time Blue Screen shooting in Munich. 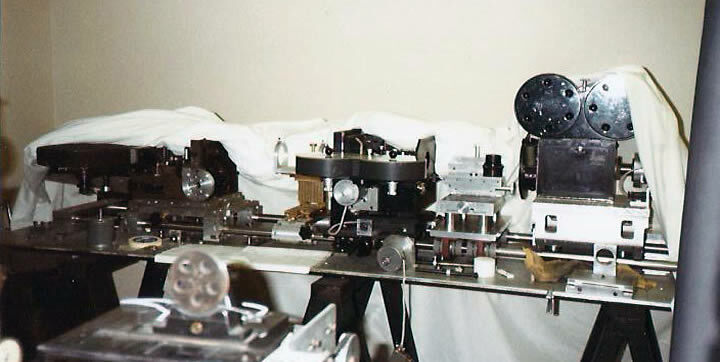 Mark and Peter scrutinize some of the VistaVision equipment (from the rostrum) that eventually made it's way into the Optical Printer built by Tony. 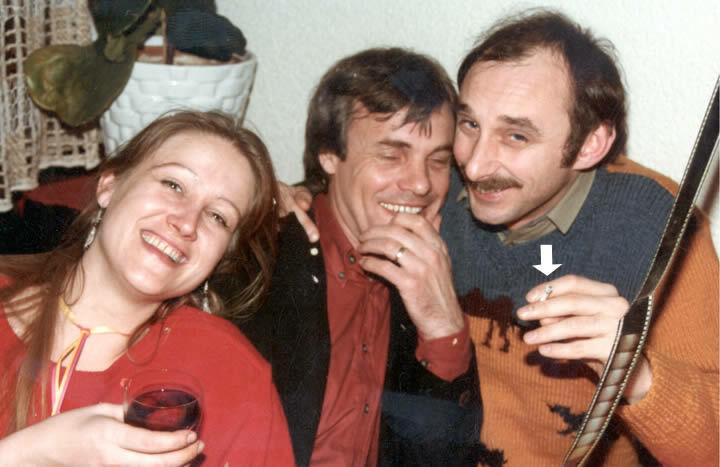 Tony Fox looking dubious as well. 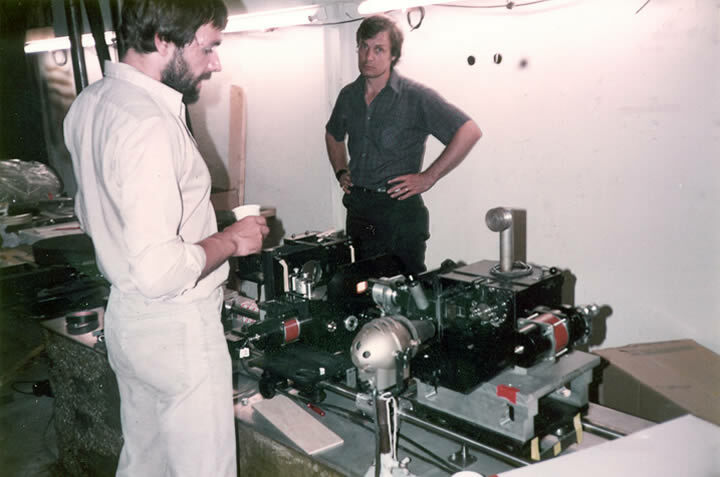 Here is the finished printer being installed at the Bourne End premises when we returned - the only thing missing was a Vistavision to 35mm anamorphic lens so we contracted David Grafton to build two lenses - a 1:1 between the two projectors and an anamorphic reduction lens (he designed and built all of the ILM lenses for their optical printers) - even at that time the total cost was £50,000 but it did what it said on the tin! 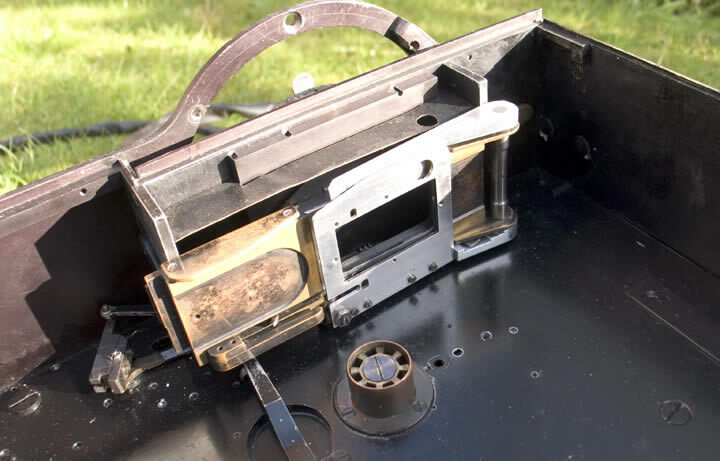 BTW the Bell & Howell camera came with two beautiful 400' magazines made in wood and black lacquered. 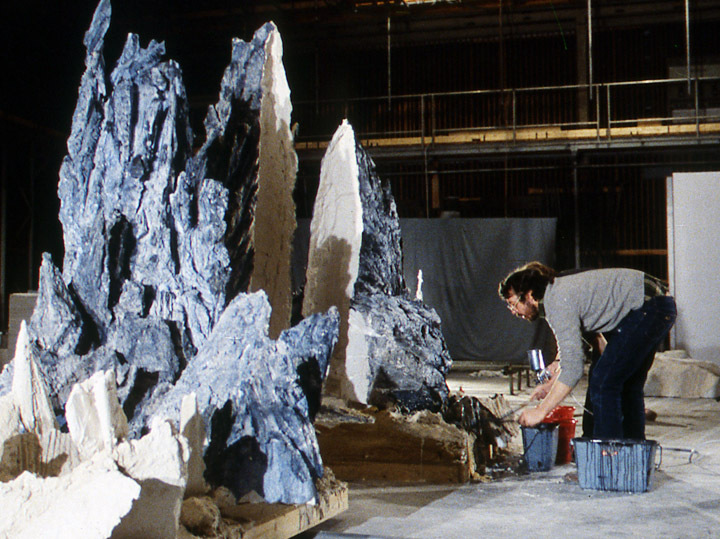 Bob makes the final touches to a mock up of the Ivory Tower prior to a camera test before the final model was finished. 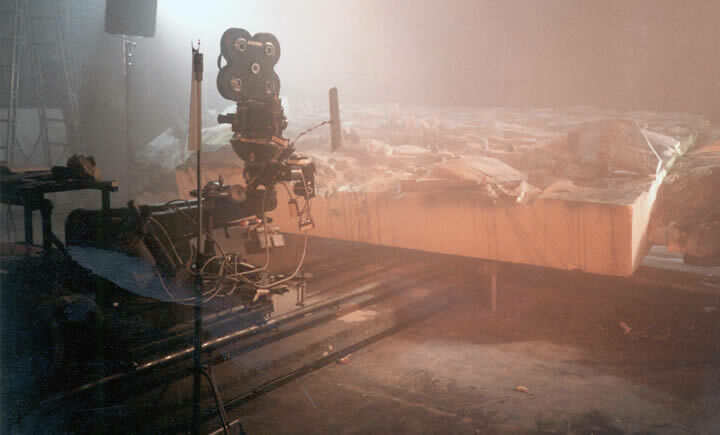 Thanks to Rick Barham (Gaffer on our motion control FX unit) for these stills below. 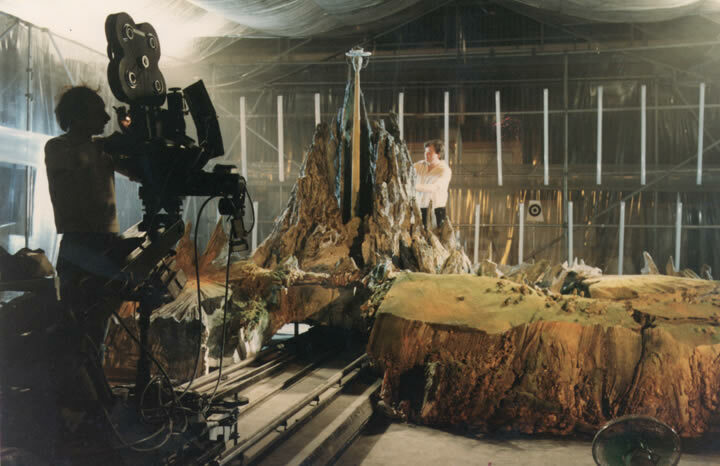 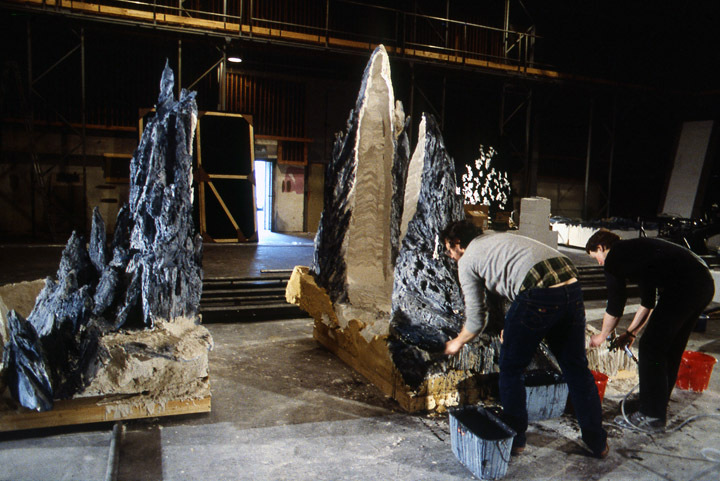 The small model of the Ivory Tower is being shot for the multi pass sequence where extra rocks were added before hand. 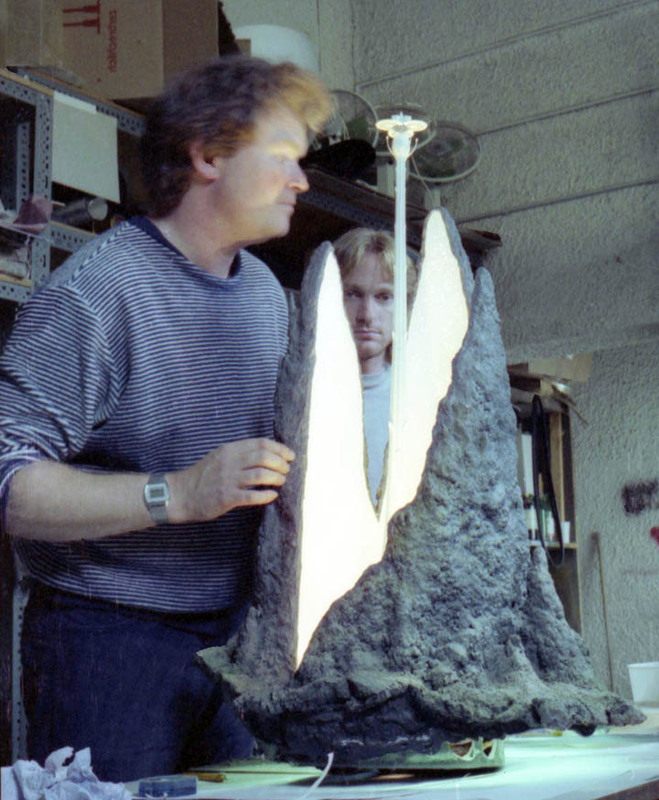 Bob Ballan and Rick Barham with the small Ivory Tower model. 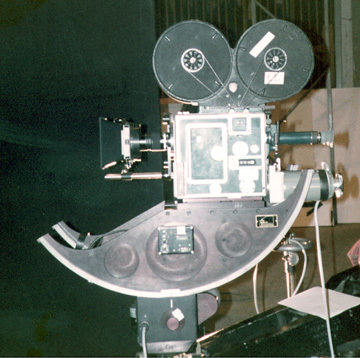 Here is the Newman Sinclair that finished up on the end of the jib arm - again this was a lucky find, the original design was standard 35mm and the gate was converted to take Vistavision - we bought it 'as is' and took care of it throughout the life of the company. 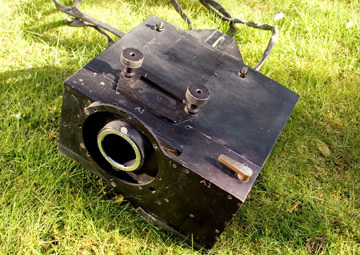 It was converted to take Nikon lenses and used the standard Newman Sinclair box style 200' magazines. 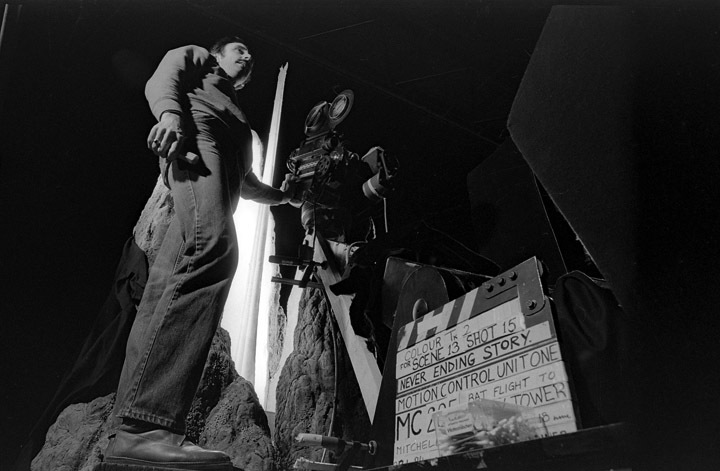 Because it was made totally from aluminium it was the obvious choice for the jib arm. 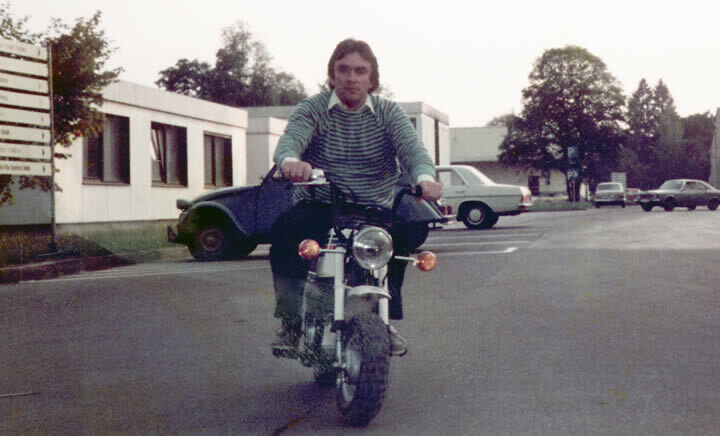 Brian does the rounds on his Harley Davidson. 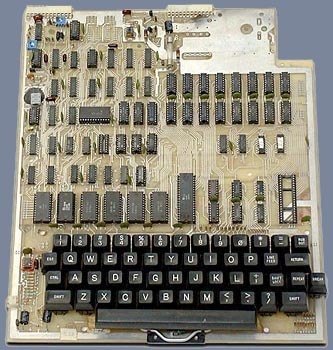 This was the first computer we bought in 1979, a Ohio Superboard II - a 6502 based single-board computer with a massive 4K of RAM and BASIC in ROM. 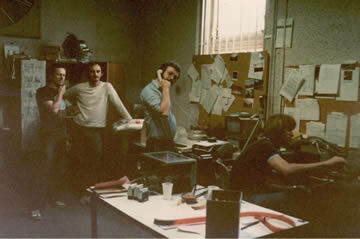 When the computer proved itself over a few months we snapped up another half dozen and used them for other rigs. 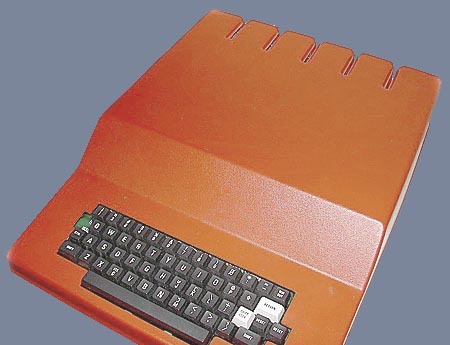 We chose this rather stylish case. 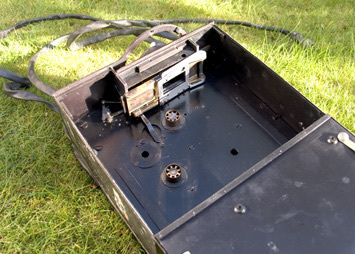 Data from the computer was recorded and saved using a cassette recorder from Boots Chemist.